Do you remember your first trip to Japan? I do, and I recently had the chance to read over some of my experience when I found an old email in which I had summarised the experience into highlights and lowlights. While I have been back to Japan several times, staying for three months on one occasion (which you can read about here), I still have great fondness for my first trip, and get pangs of sentimentality ever time I think about it. So to avoid boredom, cringing (on my part, and perhaps yours) and the Nobel Prize in Literature, please find my shortened version called "The Highlights and Lowlights of travelling in Japan". 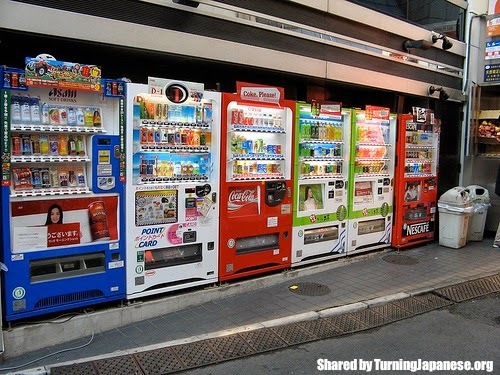 Highlight: Drink vending machines - The variety, the taste, and the availability. They all worked, gave exact change and the correct drink, and punching and kicking them was just for fun, not to get a drink out. My favourites were Qoo (fruit salad milk), Pocari Sweat (sports drink), Miss Parlour (sugar water) and the 20 or so different varieties of iced coffee. 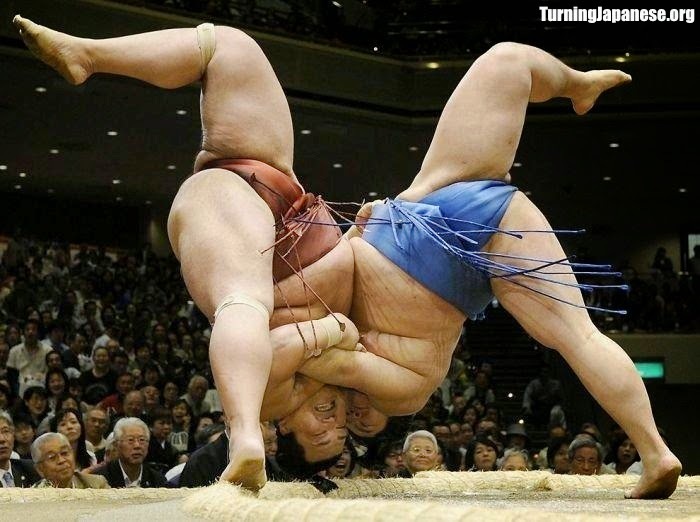 Highlight: Sumo wrestling - the sporting equivalent of cricket in Japan, in that a whole day of watching adds up to about 8 minutes and 43 seconds of actual wrestling. You can also listen to a guy commentating and hear about match records, styles of fighting, and averages between the bouts, which was useful and added to the entertainment, but didn't increase the actual time of wrestling. Lowlight: Kindly accepting an offer by the Japanese gentleman sitting next to me to have a look through his binoculars - if it’s one thing you don’t want to see close up it’s Japanese men weighing 300 pounds or more, in very small underpants (in terms of coverage) or very large g-strings (relative to my own). Highlight: The efficiency of the transport system - The trains run on time, to the minute, if not the second. Highlight: The toilets and the surprise of sitting down on a prewarmed toilet seat and being given the option of buttons labelled wash, pre-wash, heavy pots and pans, warm, spray, dry, tickle and one I was never game to try, the “powerful deodoriser”. Lowlight: Having to share them. Highlight: Japanese accommodation - clean, friendly and available (sounds a bit like a dating application), though the rooms were small - a big problem for someone who is tall, muscular and well built (which is why I was perfectly comfortable. Lowlight: Japanese floors are just as soft (or hard) as Australian floors - McDonalds, the English language and brown hair dye have all leaked into Japan, but apparently mattresses are being held by the Japanese immigration indefinitely. Lowerlight: One ryokan (Japanese inn) I stayed at in Kyoto, which had small rooms, a dirty shower, filthy bathroom and a mouldy kitchen, a smoky haze in every room, traffic outside and noisy British backpackers inside singing Wonderwall and Hey Jude until 2am. What are your highlights or lowlights from travelling in Japan?